PRODUCT DESCRIPTION: This small handheld tool usess 2 "AA" batteries to make the extending "wand" spin rapidly. When you hold the wand close to a spider web, it will literally "spin" up the web like cotton candy. The web will then accumulate on the wand and can be pulled off and easily discarded once enough is collected. Use the spinner in your hand by first extending the wand out. 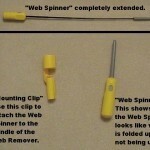 Next, turn it on and walk around the home or yard looking for webs to "spin" up. Each unit also comes with a mounting adapter. This adapter fits over the end of any standard threaded pole and the spinner fits into the adapter so you can use the pole to reach heights otherwise unobtainable from the gruond. I love this item. It makes it so easy to take down webs. I also like that it extends out so I don't have to get very close. You do have to be somewhat careful not to bend them, I have had to replace mine once. But they aren't very expensive and they save me a lot of work. One of my favorite items, I also love the bug vacuum. This is MUST HAVE! I am so happy I found this wonderful tool again. I had one about five years ago, but it broke. I looked all over the web and couldn't find it because I had forgotten the correct name. I am so happy, I tried searching again. 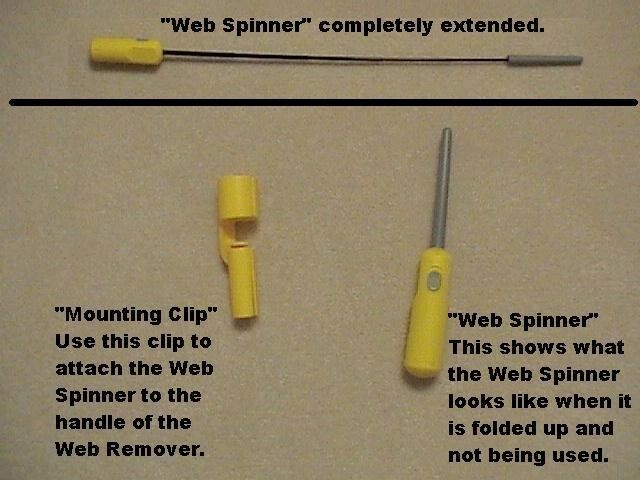 This little handy tool works great with my daily spider web creators. Because of my daily web evictions, I have less critter webs. Thanks for creating this little device! Tags: home, web spiner, webb spiner, webspiner.